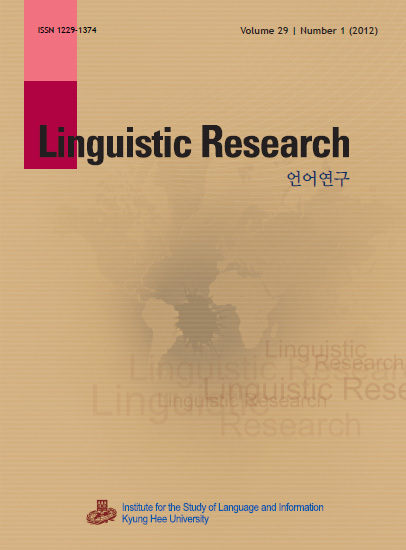 Linguistic Research is an international journal which offers a forum for the discussion of theoretical research dealing with natural language data. The journal publishes articles of high quality which make a clear contribution to current debate in all branches of theoretical linguistics. The journal embraces both synchronic and diachronic perspectives, and carries articles that address language-specific as well as cross-linguistic and typological research questions. The journal features syntax, semantics, morphology, phonology, phonetics, and pragmatics and is currently published quarterly (March, June, September, and December), including the special September issue with a particular focus on applied linguistics covering (second) language acquisition, ESL/EFL, conversation/discourse analysis, etc. All submitted manuscripts are subject to initial evaluation by the Editors, and, if found suitable for further consideration, to double-blind peer review by independent expert referees.